Should Your Parent Come to Your Home During a Weather Emergency? Elderly Care Atoka TN – Should Your Parent Come to Your Home During a Weather Emergency? Emergencies such as severe weather situations can be frightening for anyone. As a family caregiver, you are likely not only thinking about yourself, your children, your partner, and your own home, but also your elderly loved one. You must consider how you will keep everyone safe, healthy and comfortable throughout the weather emergency, and how you would manage a situation such as in evacuation if it should arise. While there are steps you can take to prepare your parent to a manager weather emergency and their own home, or to evacuate if necessary, you may want to consider bringing your parent to your own home when facing a weather emergency. * Feeling more confident and secure knowing where everyone is at all times. This will greatly reduce your worry, and allow you to focus on other elements. * Knowing you can assist you parent with their personal care needs such as hygiene and eating, and provide medication reminders. * Having your parent close so you can monitor their condition, and note any changes in their health, behavior, or symptoms that might indicate they need medical assistance during the emergency. * Faster and more efficient evacuation if this becomes necessary. Having your entire family together makes it easier to prepare for an evacuation, and to leave as one unit, ending up in the same place rather than risking confusion or someone getting lost or left behind. * Better management of resources such as food, water, and batteries, particularly if a power outage lasts for several days. If you are considering bringing your senior into your home for a weather emergency, don’t wait. As soon as the weather seems imminent, make preparations for your senior to come over, and bring them into your home. You do not want to be a trying to transport your parent when the weather emergency has begun, or when people are frantically trying to prepare for the on-coming event. Remember to take steps to protect your seniors home and prepare it for the effects of the emergency at prior to leaving. This might include ensuring all windows and doors are shut and locked, leaving an alert message in the window for rescue workers, and turning off utilities as may be instructed by the authorities. Even if you are able to be with your parent on a regular basis, or your aging parent has transitioned into living with you and your family in your home, elderly care can still be beneficial. 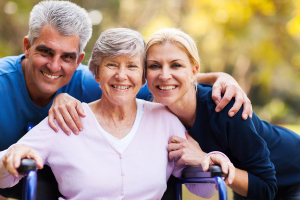 The customized services of an elderly care services provider are there to ensure your parent’s needs are met, and that they are able to live their highest quality of life. This includes when they are in your home, or even when you are there. Receiving customized care from an elderly care provider gives your parent a greater sense of independence and autonomy, encourages them to manage more of their own errands and needs, and pursue a more active lifestyle without relying on you. Not only is this beneficial for your senior, but it can enhance your life as well. Releasing some of the responsibilities of caring for your parent to an elderly care provider allows you to take better care of yourself, enjoy more flexibility in your schedule, and experience less stress. For Elderly Care Services in Atoka TN, please contact the caring staff at Personal Care Services MidSouth today! This entry was posted in Elderly Care Atoka TN, Safety at Home and tagged Elderly Care Atoka TN. Bookmark the permalink.